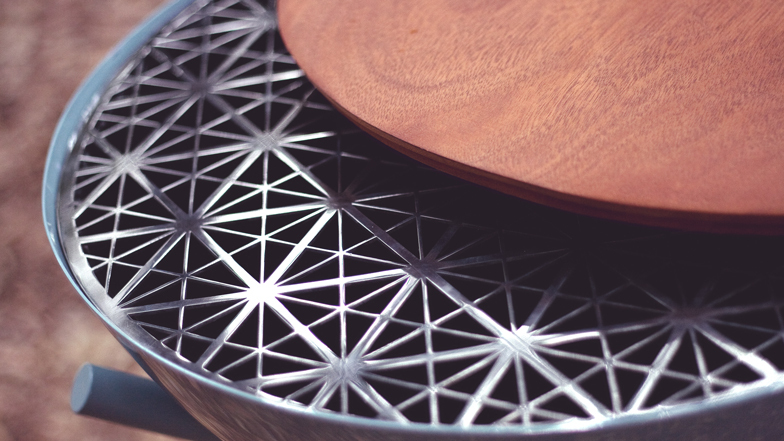 This barbecue by Barcelona designers Mermeladaestudio will char your food with geometric patterns. The stainless-steel grill is waterjet-cut with a criss-crossing grid rather than the usual bars. Celled Druida after the druidic cauldrons that inspired its shape, the barbecue comprises a spun bowl on a painted steel frame plus a lid and legs made of acajou wood. "It shows elegance and its aesthetics are planned as if it was a piece of furniture," say the designers, adding that the proportions make it ideal for small outdoor spaces. They're currently working with a manufacturer to develop a production version.